working together, parents and staff, to help give our kids the best foundation. 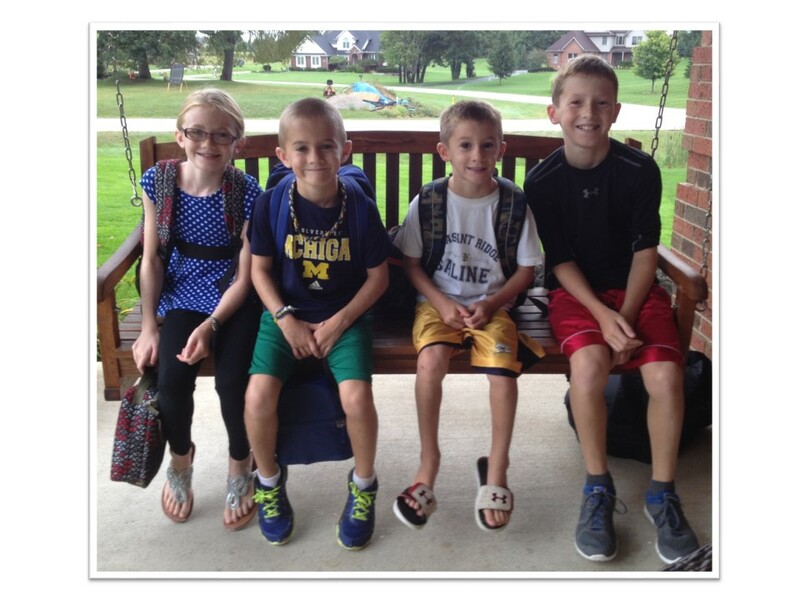 Upper L and Lower R- our first day as a Pleasant Ridge family, Sept. 2, 2014. *Upper R- L to R, the “80s ladies” Ann Friedholm outgoing President, Karyn Bloch outgoing VP Fundraising, Christine Everhart incoming 3rd Grade Rep, Jennifer Steben incoming President, Jacqui Jacobs incoming 2nd Grade Rep, Aramide Boatswain VP Communication * Lower L- Mrs. Waltz & our Kindergarten class PJ party. A few weeks ago, I told a work colleague that I was going to run for PTA President. His response? You can probably guess. With a smile, I broke down the stereotype. We don’t sit around gossiping and baking brownies (though I really like brownies; gossip not so much). We don’t make you work 40 hours and forget you have a life outside of the building. We generate funds for a school that takes excellent care of our children. We help them to go on field trips- all of them. Even the ones that cannot afford it. We buy supplies that tax dollars do not fully cover like iPads, books and gym equipment. We speak up for issues that we think affect the kids and partner with the staff to make improvements. We staff pancake dinners, art nights, bingo sessions and Field Days. 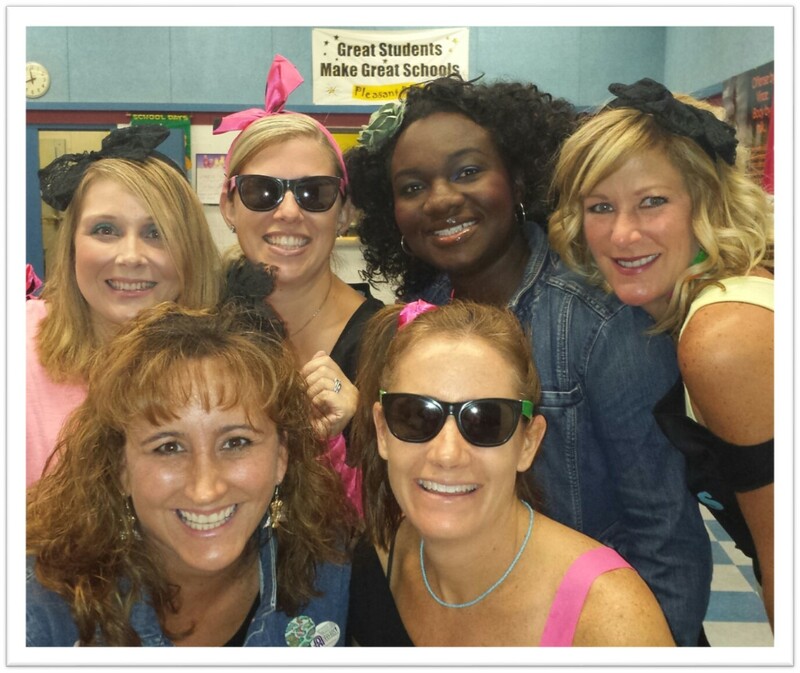 We dress up in 80s attire and have just as much fun as the kids at the Fall dance. We leave that same dance after volunteering, sticky with Sno-Cone syrup, and smiling widely. Smiling because we just made 455 kids create a lasting memory of their elementary school experience. That is what the PTA is about. It is about working together, parents and staff, to help give our kids the best foundation we can in the years they are at Pleasant Ridge. With these memories, these friends, these academics, they move on in the district with the confidence and desire to succeed. My colleague? Well, he then started talking about how he should get involved at his daughter’s school. He got it. I can’t dispute the fact that I first got involved because I was nervous. 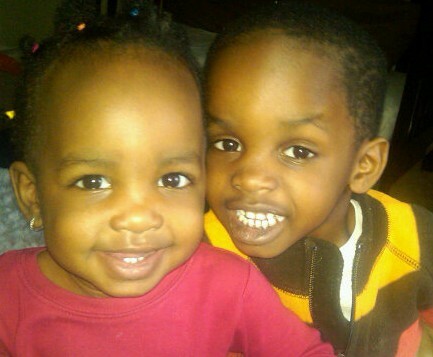 I had twins starting in Kindergarten and I was probably more concerned than they were about growing up. By volunteering, I knew what was going on and the environment they were in. Then I quickly learned how important it was for them to see me involved. I am hoping those early days helped them to adjust and also instilled in them a reference point of volunteerism. They knew Pleasant Ridge was important enough to warrant all of our attention, care and time. Time is precious. There is no doubt. We only have so much. We work, we clean, we play sports, we socialize. We need to sleep. There are only so many hours. But, being involved does make a difference. It doesn’t matter if you are a Dad, a Mom, a career person, a stay-at-home parent or a professional dog-walker. Contributing time matters. And you know what? It’s fun too! So enjoy the end of the year. Have a fantastic summer. In the Fall, check out some of the things we are doing. Come to us with your own ideas and let’s talk. Be an active Pleasant Ridge family member. I bet you’ll like it. I know your kids will. There are several people I’d love to thank. Experiencing this past year with them prompted me to get more involved (and more so than I thought I would! )… the co-chair that showed me how fun the PTA could be, the Kindergarten teacher who personifies the passion that is teaching, the VP who made me feel welcome on her team, the principal who greets his students every day by name and makes PR “the place to be” and our outgoing President who did so much for our school that I look forward to learning from her in the coming year. I would also like to thank the all of the volunteers we enjoyed working with this past year, as well as our outgoing and incoming Board. I am excited to say that we have a wonderful mix of historical knowledge and fresh faces on our Board next year and I know we will do many great things together and with your help too! Pleasant Ridge is a unique place. It’s full of talented, kind and fun people- the students, the staff and the parents. And from what I can tell, everyone tries their hardest and gives their best. It’s a special place where we all get to live together for a few years. Let’s make it count. My time on the Pleasant Ridge Elementary School PTA Board is coming to an end. I can tell you honestly, it has been the single most rewarding experience of my entire life. Truly. I have seen positive change happen and know I was a part of it. We raised a lot of money (about $100,000 in the last 2 years). We bought a lot of things (~100 iPads, 50 Chrome books, an Apple TV, Smart Boards, books, a sound system, bulletin boards, and pencil sharpeners), we renovated the teacher’s lounge, we approved 15 teacher grants, and we covered expenses for teachers who were previously paying for them out of pocket. We hosted a number of events to build PR Pride (Red Carpet Welcome for 1st day of school, Kalahari Nights, School Dances, PR at Barnes & Noble Day, PR in the Parade) and we resurrected the PR Carnival! Lastly, we made PR voices heard across the district on such things as leveling the technology playing field across the elementary schools, school safety, and most recently, class size. I am extremely proud to be a part of the PR community. Our PTA built upon successes of past PTA’s. Now, as I look forward, I’m excited to see the change the new group of leaders will deliver as they drive us to the next level of excellence. This group has a ton of potential but cannot do it on their own! I encourage you to lean in and help where you can. DON’T assume someone else will do it. DON’T assume they’ve got it covered. DON’T be afraid that volunteering for 1 thing will mean you will be hounded forever. Our school flourishes when we join together as one village where everyone helps in the way that best matches their skills and interests. What will your role be? Thank you to all the volunteers who have helped in so many different ways over the past 2 years! And, from the bottom of my heart, thank you to Shelly Mareno, Melissa Walker, Amy Telgen, Carie Tillman, Karyn Bloch, Carrie Harris, Aramide Pinheiro-Boatswain, Cheryl Girven, Carmen Woods, Amy Lepore, Amanda Warren, Lorrie Welzbacker, Kelly Hickey, and Brad Bezeau. It was my pleasure to serve on the PR PTA Board with you! Together, with all of our awesome volunteers, we really did make a difference! Hi everyone! I’m Amy Telgen, the Secretary and the most recent addition to the PTA board. My son Adam is in Mrs. Schwartzenberger’s 2nd grade class. He’s a basketball, soccer and car enthusiast who is a joy to watch learn and grow! 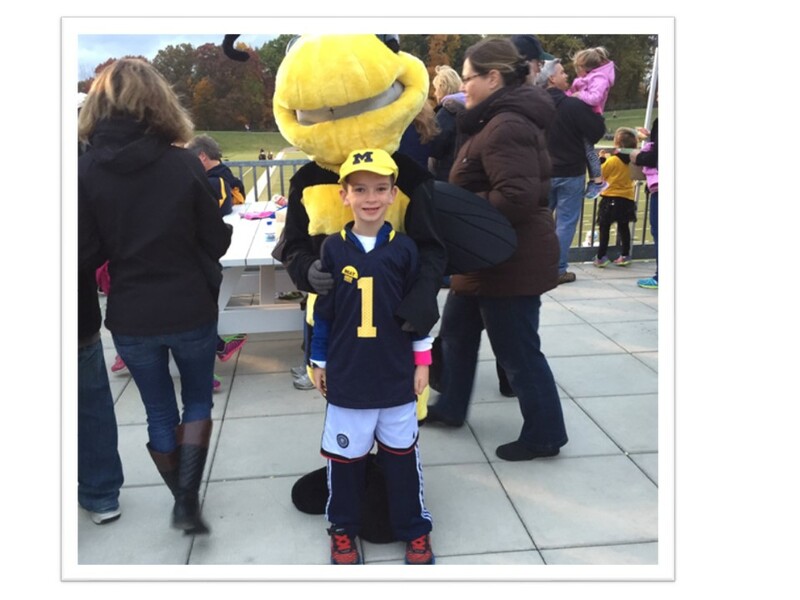 Adam is pictured here at the football game last Fall, wearing both Michigan gear and Germany soccer team shorts. And I just realized that he can also be seen photobombing Matthew Mareno in Shelly’s blog entry from December! As the newest member of the board, I’d just like to share with you what my experience has been like so far. Last year was our family’s first year at Pleasant Ridge and for a lot of reasons, I was hesitant to get too involved. I have some health issues and I was afraid of committing to do things and then not being able to follow through. So I volunteered for things that I could do at home, like typing published stories, refilling math folders and cutting and counting box tops. It was nice to feel helpful, but I was missing out on feeling like part of a community and getting to know other parents. And I also knew that Adam wanted to see me spending time at school. As a parent whose stressful career days are in the past, and with only one child, I have much more time on my hands than most moms. But there were limits to what I could do, so I struggled to find a way to be more involved. When I found out about the opening for the secretary position, it seemed like a good fit for my skills as a sort of detail-oriented former IT person. Yet it had boundaries and didn’t feel like a big, scary responsibility. So I went for it – and I’m so glad that I did! Being at the meetings has been so eye-opening for me. I really had no idea how much the PTA does for the school, both financially and otherwise. It’s just incredible. And the parents who are there are so dedicated and giving of their time, even though they have 3 or 4 kids or careers of their own. They all want to create the very best experience for all the kids at Pleasant Ridge. Even though Saline is a top-notch school district, there’s only so much money to go around and the PTA covers the cost of a TON of things at the school (see Shelly’s post below for details on that!). And there are all kinds of fun non-monetary things that the PTA manages or helps out with, like Art night, Math night, Science Fair, Zero the Hero, Teacher conference dinners, the upcoming School Dance and March is Reading Month… the list goes on and on. Another thing I’ve learned is that by being at the meetings, I get to find out what’s going on, whether at the school, or within the whole district. And it can also be a great opportunity to bring up topics of concern or offer suggestions, too. But by far, the MOST important thing I’ve learned by becoming involved is how great it feels to be contributing something – and how thrilled my son is to see me helping out. So my message to you would be to find “Just One Thing” at Pleasant Ridge to volunteer for. We all have challenges that might make it difficult to help out, whether it’s your career, your other children’s needs, or maybe even your health. But there are so many different ways to contribute; there IS something that will work for you. Parents on the board generally only serve for 2 years, so there will be openings to fill for next year. And we’re going to add spots for grade representatives on the board, too – one parent for each grade – so they can raise their concerns and hear about what’s going on and then communicate back to the other parents in that grade. Please consider contributing some of your time. Come to the meetings if you can or sign up for the volunteer emails to find out where help is needed. Because help is always needed! Even if it’s just for an hour. It’s up to all of us to continue to make Pleasant Ridge a wonderful experience for our kids. “Many hands make light work.” Thanks for reading this! First, thanks for reading this blog. I think there’s like 25 of you :). I’m Carmen Woods, mom to Jackson Woods, second grader in Mrs. Zimmer’s class, who at this age seems to constantly have a loose tooth. 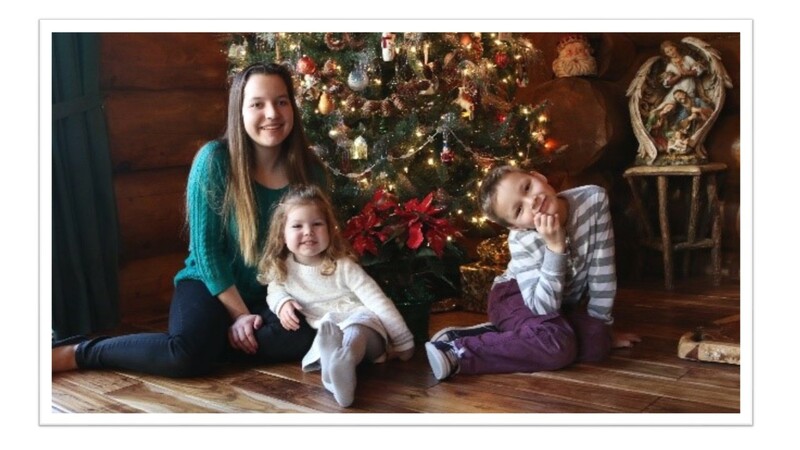 I also have two other children, Erica- a 9th grader at Saline HS, who knows ABSOLUTELY everything (enter sarcasm) about anything, and Veronica- a 3 year old who refuses to do ABSOLUTELY anything (no sarcasm, I kid you not, terrible 3’s). Ya feel me? They’re all adorable though. So not only am I VP of Enrichment at Pleasant Ridge (overseeing any events that don’t raise money – that’s Karyn’s job, see second blog 🙂 ), I’m also the treasurer at the HS. On top of those I’m a CEO, Chauffer, Master Gardener, Iron Chef, Spa Coordinator, Private Tutor…. Kidding!! It feels that way sometimes, I’m sure to us all, be us a SAHM, working mom, or dad. Either way I still wanted to be involved at the school. I chose VP of Enrichment, and that covers enriching our children’s experience here at PR. Even I became enriched! I became enriched in knowledge, partnerships and a great community. The entire PTA is built on community. If I need a hand, they help, if you need a hand, I help, and of course the staff always helps. So, regardless what some think, the PTA is not a clique, we don’t eat bon-bons with each other every Thursday, (sounds fun though) and we’re not all BFFs. We work together as a team to strengthen our children’s educational experience. I’m so honored to be able to say that I’m a contributor to this. So if you’re reading this blog, (and you are) this means you’re interested. Right? Right, so let’s do something about it then, come CONTRIBUTE with us!! Making every school experience fulfilling. Happy New Year, Pleasant Ridge Friends! It’s hard to believe that we’re already into 2015 and partially through the school year. Where does the time go? Well we all know the answer to that – balancing work, family life, extracurricular activities, or perhaps I should just call it LIFE! Our lives go by so fast that sometimes it’s hard to just sit back and enjoy what is going on around us. I know I definitely can relate. As a stay-at-home mother of four (4 girls ranging from ages 2 – 9), I definitely can say that we live a busy, yet rewarding life. I am grateful and lucky to be able to stay at home and take care of my girls. Like many of you, I spend my time taxiing the kids back and forth to school, soccer practice, dance lessons, doctor appointments, school-sponsored events, etc. And that’s just the stuff involving the kids! But as chaotic as it may get, I enjoy every minute of it. I’m not kidding myself; I know I can’t stay home forever and will one day have to re-enter the work force. But I promised myself that during the small period of time that I am dubbed a “stay-at-home mom” I would make the most of it. With this being said, I have found a wonderful means of interacting with both my girls and the community. This rewarding experience comes from volunteering at Pleasant Ridge. I started out by assisting with small tasks in the class rooms and helping with the different holiday parties. I then decided that in order to really make a difference, that I should attend PTA meetings. I met a wonderful group of parents who all wanted the same thing as I did– to make our children’s school experience as fulfilling as possible. After a few meetings, I was very excited to help make the school year fun and successful and decided to take on the role as a board member – Vice President of Volunteering to be exact. It has been a great year thus far and I have met some amazing kids and parents! From my experience as a Pleasant Ridge parent and volunteer so far, my best advice to you is to get involved! I know life with kids is “busy”, but any way you can help volunteer is much appreciated – both by the school and by your kids. Whether it is clipping box tops, reading in the classroom, donating items for teacher dinners or dressing up as Zero the Hero, it all makes a difference. Every little bit helps! So if you can donate an hour, a full day or multiple days per week, it matters. And remember – volunteering is fun and rewarding. I’d love to hear from you, so please do not hesitate to contact me with any questions you may have. I hope to see all of you at Pleasant Ridge in 2015!! Believe it or not, the PTA is the backbone of many Pleasant Ridge activities. Due to recent budget cutbacks within the district, the PTA has stepped in and helped with filling in some of the void. We pay for many activities that the school cannot cover by organizing fundraisers and through other community give back programs. I would like to highlight a few fundraisers and also some expenses that you may or may not be aware of. For the fundraising part, you are probably familiar with the 50’s Dance and the Auction/Carnival but the smaller fundraising opportunities almost make a big difference. Do you purchases items through Amazon? If you use AmazonSmile and sign up under our school, we will get a percentage back from your purchase. Do you love shopping at Target like I do? By linking your Target card to our school, we get 1% back. Last year we received a check from Target for $765.00. If you shop at Meijer and/or Kroger, they also have give back programs that support our school. Signing up is so easy and simple and takes only a minute or two. These are great ways to give back to the school without much effort. When is comes to the expenses, I’m sure you have heard about the big items that we have helped purchase for the school like mini iPads and smart boards but did you know we also cover other expenses you may not know about? We budget for each teacher to receive a $100 reimbursement for classroom supplies. Last year they only received $50 from the district for classroom supplies. How is a teacher supposed to supply their classroom on $50? We felt that by offering them an extra $100, it would help with supplies that they would either pay of pocket for or not have at all. Another item on the budget is field trip transportation costs. We cover bus rides to and from field trips. Without that, the students would not be able to go on the fun field trips that they love. A few other expenses that we cover are assemblies, curriculum nights, student planners (2nd and 3rd grade), first day folders, and mini grant programs for the teachers. Before becoming involved I had no idea what the PTA did for the school. Other than knowing about the big items that were purchased by the PTA, I didn’t realize that they also cover other costs. Needless to say this has opened my eyes and helped me understand more about the PTA and what is involved. I could not be more thrilled to be part of the PTA and I encourage you to also become involved and find out what it’s all about. Plus your kids will think you’re really cool. At least mine does! In hearing, sound is perceived by the ear, and requires very little or no concentration. Listening is an action where you choose to actively concentrate on what you hear and your brain processes the information into knowledge. This is a constant struggle with my kids .. but I’m also guilty as a parent. One of the daily struggles I face is getting (and staying) involved with my children’s daily activities and growth, especially at school. Like you, I (used to) toss every stack of papers, little notes and flyers in their cute folders, and one more piece of paper (or email) from the PTA into a pile destined for the recycle bin. As a parent I heard a lot, but never took the time to listen to the messages because I was too busy to get involved. It’s really hard to keep up! But I found a simpler way – I call the school, check out the school facebook site, follow the PTA website and I email all the parents I know (especially the PTA) to find out what I may have missed. School is hard – and most children can’t read the survival handbook, so we as parents have to keep it together and CONNECT with the school. As my son moved through Kindergarten and 1st grade, I started to lose touch with his daily activities and progress at school. Conferences were fleeting and I never got to be a part of the community he spent a great part of his week in. I started coming to PTA meetings as a “check the box”, volunteering was absolutely not possible with my schedule. And every Friday he would complain about the fun stuff I didn’t get to be a part of. So, instead of just hearing, I started to listen. I volunteered to help (from home) and popped in to help at lunch whenever I could. And I got to know Eric’s mum, and ran into Owen’s mum at soccer and he would smile the widest smile when I popped in to help at lunch time. Then when my kindergartener started, I was popping into Brad’s office whenever I had a question. Yeah! I get to call the principal Brad now – ’cause Mr Bezeau is not what you call someone who you speak to on a regular basis… cool huh! It’s hard to make every meeting, especially in the mornings – but simply following the PTA website or (actually) reading the Brad’s messages gets you up to speed. While the reminders and notes, emails, text messages and voice mails may seem overwhelming, these are all meant to be great resources for connecting with the school. All you need to do is hear and listen to the messages. Decide what applies and fits your needs and if you need to connect further, use the communication pathways: Leave a comment on the PTA website, call the office and speak to Principal Bezeau. And if you would just like to stay updated follow the PTA website, sign up for reminders or follow the Pleasant Ridge Facebook page. I volunteered to help with communication and would love to hear if we are doing a good job or not… our feelings won’t be hurt. But we would love to know what you would love to hear more about and how you would like us to communicate better with you .. so you listen more when you hear us! The absolute favorite topic of any man, woman and child anywhere! No – please don’t run away – I am completely aware that fundraising is the one thing most of us have an absolute love/hate relationship with. It’s the one thing we’d love to run very far away from and hope that everything we need to have the best for our kids for all their sports, clubs and school activities will appear, as if by magic. When my family first walked into Pleasant Ridge in 2011, I have to confess that I was honestly but pleasantly shocked to see that the school did indeed have computer terminals in it. There were so many rumors running rampant: “this school has this, that school has that, this school, well, who knows?” I had no idea what to expect. Then it hit me: so much of what we have relates directly to our fundraising. And our self-image, I think. You see, a lot has gone into fundraising efforts, and in turn really benefited Pleasant Ridge. Since much of this takes place behind the scenes, I, like many parents, did not immediately see the link between fundraising and tangible school improvements. There is so much to be proud of: as a Pleasant Ridge community, our fundraising has delighted our children by putting more swing into our playground, updated the basketball court on our school grounds and added new books to our school library. It’s brought inspiration to our teachers whose grants are awarded to enhance school programming and provided simple fun through recess packs for the classrooms. It’s given the teachers an updated lounge where they can take five, actually heat and cook food, converse and then return to our children refreshed and knowing we care. It’s given our students modern technology that is now integrated into their curriculum through the use of iPads in every classroom! But for me personally, chairing Fundraising has drawn me into this wonderful school of ours. I have never felt happier than when I am doing something for the school and there are so many parents who offer their help. I am truly energized by those around me who are so passionate and happy to help make our ideas real. In September, we had the best Open House Book Fair in Pleasant Ridge history and it was because so many parents, old and new, offered their time and worked their butts off for an hour and a half, and because other families chose to spend time (and money!) at the Book Fair. Their effort translates into Scholastic Dollars that purchase Birthday Books for the children as well as books for the school library and classrooms. We had a fundraising meeting where everyone supported everyone else and came up with great ways to make our events fun for families and the staff alike – it’s nearly time to get ready for our Cloudy with a Chance of Pancakes Night!! And hopefully some of you are finding family time to get away to Kalahari together with other Pleasant Ridge Families. As you read this, we are in the thick of our Fall Fundraiser. It was great to be a part of a bunch of parents putting on 80s outfits and getting each grade excited about the upcoming 80s Dance A Thon and Pie in the Face Assembly beside our principal, Mr. Bezeau, during their lunch hours. I am hopeful that all the students walked away with realizing no matter what they are able to donate, it all makes a difference and will bring great things to both them and our school. I truly hope that after reading this you’ll see how much we value anything anyone can do for our school. The bottom line is each one of us has something to give…time, money, talent…and each contribution really does make a difference in the lives of our children. This is my 5th consecutive year of being a PR parent, but only my 2nd year of being heavily involved with the PTA. I steered clear of the PTA for the first 2 years. Why? I was afraid of being “sucked in”. I wasn’t sure I had the time, and I was afraid that once I volunteered for one thing, I’d be hounded to do much more. So I volunteered to be a Room Mom and laid low with everything else. In my 3rd year, I had 4 children attending PR … so I was feeling like I should be giving more to the school. I also had a growing need to feel more connected to their school life. I wanted to know more about the school system – its strengths and its shortfalls. I wanted to be assured my children were getting a great education. So I got a little more involved. I attended a couple of PTA meetings and ran the Silent Auction. And then I jumped into the deep end by volunteering to lead the PTA Board. My background is in business management, and I saw a lot of parallels between running brands like Lean Cuisine and running the Pleasant Ridge PTA. There’s one big difference, though. Leading the PR PTA has been quite possibly the most rewarding experience of my life! Together, the PTA has made a lasting difference at PR, and I know I’ve been an important part of it. Our teachers feel supported and appreciated. Our classrooms have iPod stations (not all Saline schools have these). Our voice is heard by the District Administration and the Board of Education. I can’t seem to find the words to express how great of a feeling it is to be a part of that lasting change. I urge you to lean in … find areas to engage. Don’t be afraid of getting “sucked in”. One of our values is “We believe in engagement by leveraging a broad range of talents and commitment levels.” You set your boundaries. Every bit of involvement and engagement matters. And we truly want whatever you can give! So am I a cliché? Quite possibly. The business woman who became a stay-at-home mom, who is going crazy with the PTA with her type-A personality. When people find out I’m the PTA president, I often hear the snickers like, “How did you get stuck with that job?” A few years ago, I probably made similar comments. But now? I don’t really care. I will always look back on this opportunity as one that helped define who I am as a mother, a person, and a community member. I urge you to engage through conversation, participation, and/or volunteerism … for the benefit of you, your child(ren), the school, and the community as a whole. I promise you will find it to be one of the most rewarding experiences of your life! 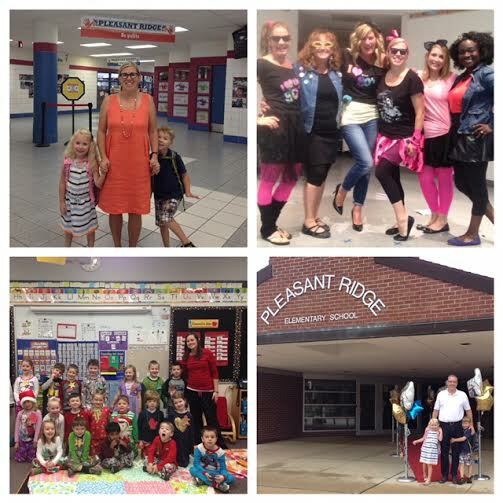 Welcome to the new Pleasant Ridge PTA Blog – Help Us Name It! We’ve heard your feedback. We want to make it easier than ever to feel engaged and involved with the happenings at Pleasant Ridge. Because we know not everyone can attend the PTA meetings, we are introducing this blog to open up communication. Each month, a PTA Board member will blog about a different aspect of the PTA (and hopefully you will as well). In addition, we will be publishing summaries every month to give you a feel for the topics discussed at the PTA Board meetings. This will update you on the issues and concerns related to our school, as well as accomplishments and celebrations. You will have a better understanding of the needs of our school and our plans to meet those needs. Please be patient with us as we get this started. We know we want to make it easy for PR parents to engage and we think this method of communication will help. However, we will make mistakes along the way. Please provide feedback to help us make this blog a helpful tool to connect with all PR parents. We hope you will respond with questions, comments, and concerns. You can start with helping us name this blog! The winning family will receive a $25 Scholastic Gift Certificate for our December Book Fair! Entries will be accepted through November 15th your best suggestion in the comments section! Our first installment of the PR PTA Blog will be posted next week. So be sure to check back to hear what our president, Ann Friedholm, has to say about the PTA. I suggest PRPS, The Pleasant Ridge Postscript, or The PR Post. My thought for the blogg is Pleasantly Speaking. Okay one more…The View From Pleasant Ridge.